Does fall baking always have to include apples and pumpkin spice? Heck no! 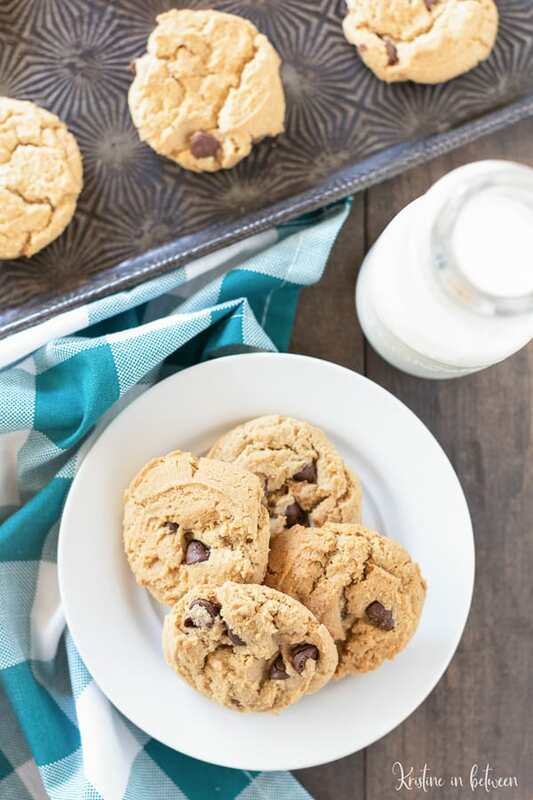 This simple recipe for thick and chewy small-batch chocolate chip peanut butter cookies will have you convinced! Hey friends! Kristine from Kristine in between stopping by with one of my favorite, favorite, favorite fall recipes for you and no, it’s not apple, or pumpkin, or pumpkin spice! Don’t get me wrong, I’m a huge fan of all things fall (check out my free fall bucket list right here! ), including pumpkin cooking and baking, but if your family is anything like mine, they could probably use a teeny break from pumpkin flavored treats. 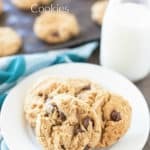 These chocolate chip peanut butter cookies are just that; and even better yet, it’s a small-batch, and one-bowl recipe! Oh, and I bet you even have the ingredients on-hand right now! The recipe itself if super simple, basically you cream the butter, sugars, salt, and baking soda together until smooth, add in the wet ingredients and then the peanut butter, stir the flour in, and lastly fold the chocolate chips in. 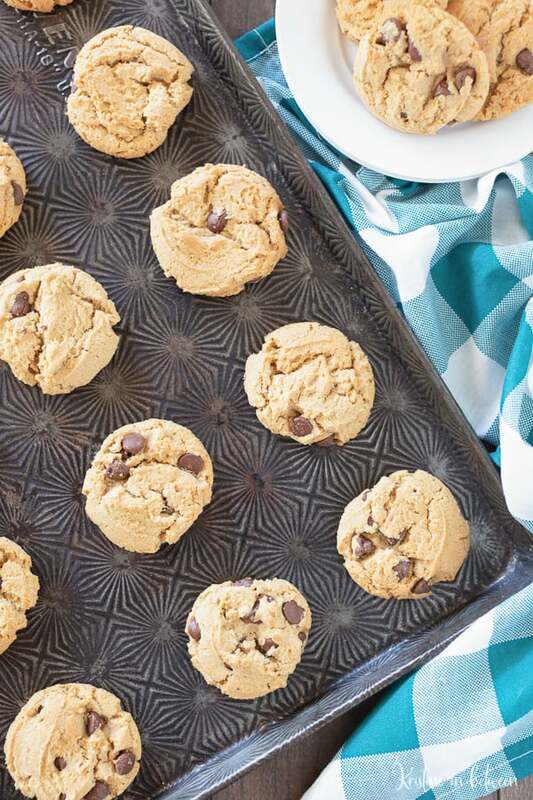 To make these chocolate chip peanut butter cookies, you’ll only need one bowl, one spoon, and two lined cookie sheets. So simple! And while we’re talking about baking, let’s go over some ideal baking supplies. I recommend using a light colored aluminum cookie sheets with rolled edges, lined with parchment paper for the best results (not like the one pictured, which is a cute little antique one). These types of cookie sheets bake more evenly and are easy to grab onto when they’re in the oven. I also recommend scooping the dough onto the cookie sheets with a cookie scoop to ensure all the cookies are the same size. I used a 1.5 tablespoon scoop for this recipe and it made 26 cookies. Once the cookies are done in the oven, they’ll need to sit on the baking sheet for a few minutes, but then you can transfer them to a wire rack to cool completely. 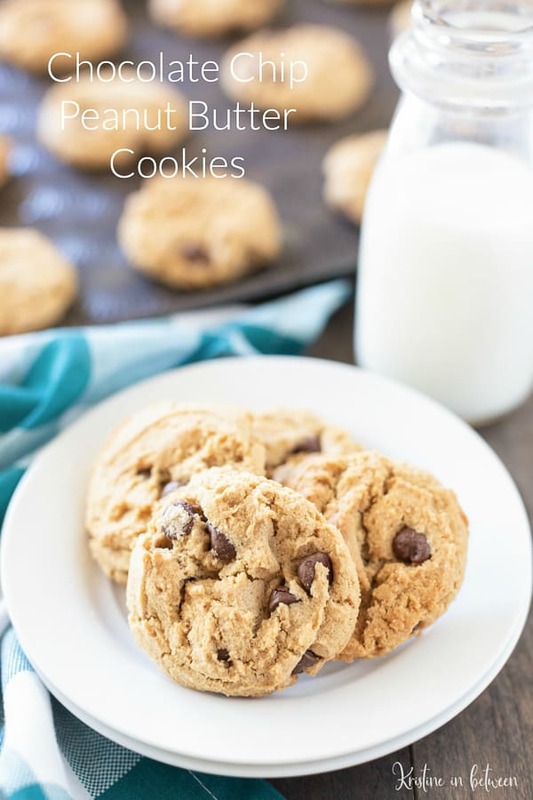 The cookies are thick and chewy in the center with a nice rich peanut butter flavor. The chocolate chips (I used semi-sweet) meld perfectly with the cookie to create a balanced chocolate to peanut butter ratio. You’ll love everything about them! These chocolate chip peanut butter cookies are a tasty alternative to all the pumpkin goodies floating around this time of year. Using light colored aluminum baking sheets lined with parchment paper will yield the best cookies. I recommend using a cookie scoop to scoop the dough, so the cookies are equal in size. You can use any kind of chocolate chips, but semi-sweet or milk chocolate seem to taste the best with this cookie. You can double the chocolate chips (up to 1 cup) if you’re a serious chocoholic! The cookies need to sit on the baking sheet for a few minutes after baking, but then you can cool them on a wire rack. The cookies are best if eaten within 3 days. A thick and chewy peanut butter cookie loaded with chocolate chips! In a medium bowl, cream butter, peanut butter, sugar, and brown sugar until smooth. Add baking soda and sea salt and stir. Add egg and vanilla extract and stir until fully incorporated. Using a 1.5 TBS cookie scoop, scoop the dough onto prepared baking sheets, 2 inches apart. Allow cookies cool on the baking sheet for 5 minutes prior to transferring to a wire rack. Hi there! 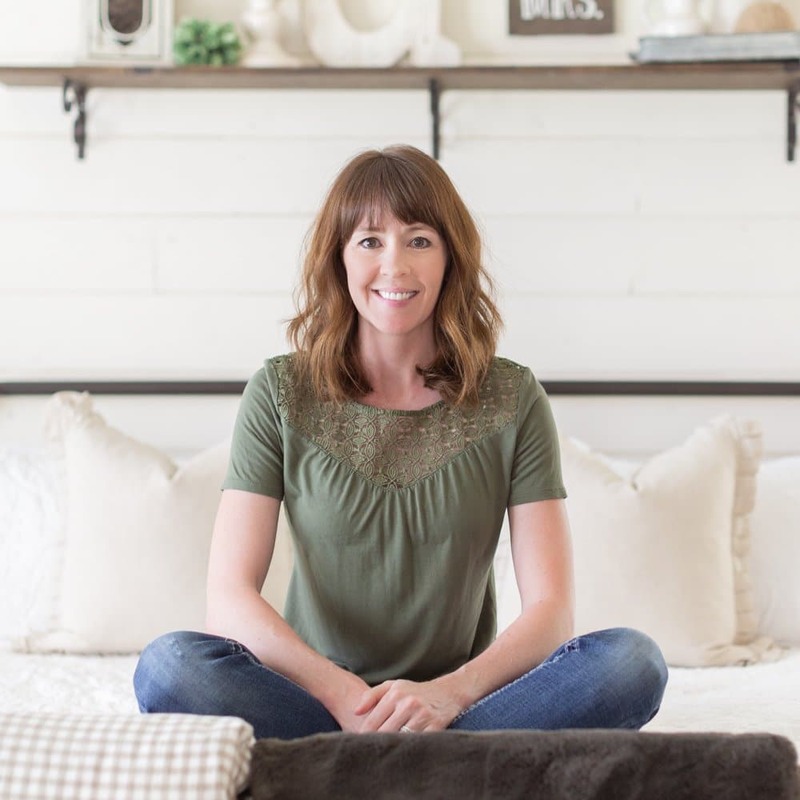 I’m Kristine the cookie baker, photo taker, and fitness lover behind the lifestyle blog, Kristine in between. I believe in finding balance between health, happiness, & lots of homemade cookies. Stop by and say hi sometime! Don’t forget to check out all of my pumpkin recipes and download your FREE PDF version of my fall bucket list, it contains all sorts of fun family activities to do during the fall!